Beautiful Ocean Front Home with six bedroom/Four bath. New memory foam mattresses in King and Queen rooms. Enjoy the heated pool, hot tub, dock and beach. Located on Cudjoe Bay with panoramic view of the Atlantic and deep water swimming. Kayaks are provided for your enjoyment. There is a huge screened in porch for your outdoor dining enjoyment. This a very relaxing and beautiful location. There is dining for 12 inside and dining for 12 on the screened in porch. There are several local restaurants within 1-8 miles of the property. Bahia Honda State Park Beach is about 8 miles away. 20 Miles to Key West and all it has to offer. The pool is located beach front with covered lounge area. You can swim and fish off of the dock. we recommend always wearing water shoes when swimming in the ocean. This is an AWESOME home! We LOVED this property! We had our whole family here to celebrate my husbands retirement. There was plenty of room for all 4 of our children, their significant others, and all 6 of our grandchildren. The pool was small but perfect....beach, a bit rocky but the kids were able to build sandcastles,..... the Kayaks provided were used and were awesome! Hot tub was clean and definitely used! The house was very clean and well stocked. The beds were all very comfortable. Only slight concern was the jack and Jill bathroom between the master bedroom and adjoining bedroom. Seemed to “run” continuously. The gas grill was used multiple times. Just really enjoyed our stay and have so many wonderful memories of our stay in Cudjoe Key!! Spacious for all 5 couples! Home fit the needs of 5 couples staying together without feeling cramped. Spent a lot of mornings and evenings enjoying the screened porch. Pool was smaller than it appears, but to cool off it was perfect. We all discussed we would recommend and stay again! We are delighted your enjoyed your stay. We'd love to have you back again as our guests. All we can say is amazing. This house was perfect for the 5 couples and 2 adults that vacation together every year. It was spacious, clean, and perfectly located. We had one day of rain where we were still able to be outside on the decking playing cards all day. We will definitely be staying here again. When you arrive and there is a rooster crowing in the car port tell Diego his Minnesota family misses him. pleasant grounds. The iguanas, herons and the roosters were all great entertainment while enjoying the pool and beach. Would highly recommend this house and area. We enjoyed many great restaurants, mini golf and the walking paths in the area. It is also 30 mins from Key West. We spent time there and enjoyed all they had to offer as well. Highly recommend the house and location. 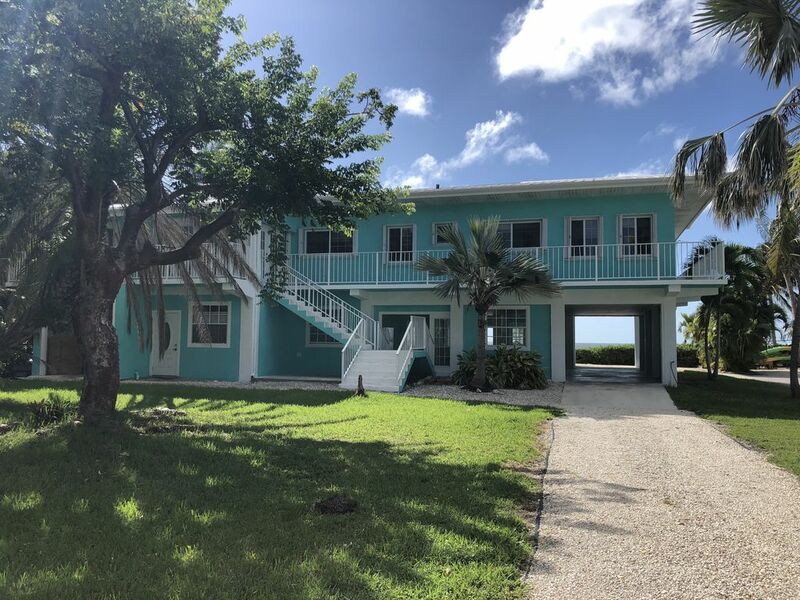 Cudjoe Key is the perfect location for the lower keys & the house is in a great private spot. The house is clean & large enough for multiple families. I have no complaints about the house. The pool was a little hot for our taste but the pool man changed the temp for us which was nice of him. The only thing I would note is that the doors are very thin & you can hear everything in the house so if there are noisy children or a heavy snorer just be aware. Buy some earplugs. Absolutely loved the property! The view was amazing. The house was very comfortable for our entire extended family. The large kitchen area made it so easy to prepare food for all of us. It was a bit too cold to take advantage of the pool, but the hot tub was wonderful. Definitely will plan a return visit. Conveniently located 20 miles from Key West and 20 miles from Bahia Honda State Park. Day spa, gym/yoga studio, fish market and 4 great restaurants all located within a mile. Great kayaking. Base pricing is for up to 6 guests. Each additional guest is $20 per night. At least one person in your party of guest staying at this home must be minimum age of 30 years old. We are pet friendly with a $100 pet fee. There are certain breeds of dogs that our insurance company does not allow. Please check with us before booking if you plan to bring your pet. There may be additional fees if you are bringing more than one pet.